Click on question to view response. How do other chambers of commerce use the Business Intelligence Report? The most common way that chambers use the Business Intelligence Report is to e-mail or print/mail the publication to the membership as a value-added benefit to increase member retention and goodwill. However, chambers of all sizes have created different ways to use and distribute the Business Intelligence Report. Some insert it into their chamber newsletters to increase readership. Many have found it to be an effective tool for selling memberships to new companies. Some chambers secure sponsors, while others rely solely on increased member retention to fund it. All have found that it translates into positive feedback from members. How do you know that our members will like the publication? There are two answers to this: First, we based this publication’s content on what chamber members said they wanted in a business publication and in a chamber benefit. Business owners want their chamber to communicate to them, to make them feel like they are getting something for their chamber investment. However, the information they want is knowledge that will help their business thrive, and they want this information in short, easy-to-read bites. This is what we provide, and we continually survey members to make sure we are still meeting their needs. Second, you can always ask them if this is something they can use. However, don’t fall into the trap of asking just a few people for their opinion. Those few people do not represent the average chamber member. Instead, we will allow a survey of up to 500 randomly selected members to get their opinions on our publication. This is an option that we offer for free to chambers that are serious about using our product. Call for details. Don’t our members already have too much to read? Yes, they do. That was one of the most often-stated problems for chamber members. It’s also one of the most-stated reasons why chamber members appreciate our publication. We offer them more usable information, but require less reading time. Much less. 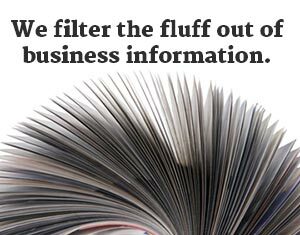 Most business publications are about 80% fluff and 20% usable information. We focus on the 20%. Don’t our members already get this type of information? Some members already do receive a portion of this information from their original sources. However, our staff scans over more than 150 sources each month. This makes it highly unlikely that anyone, even an info junkie, could read one of our publications and claim they had already read even half of the information in other publications. If they did, they could have saved dozens of hours of precious time just by reading the Business Intelligence Report. What if we try your service and find out later it’s not right for us? Are we locking ourselves into a contract? Not at all. You can cancel anytime you want. It’s our job to earn your business every month. Can the Business Intelligence Report be used as a revenue generator? Yes. Keep in mind that the best way the Business Intelligence Report generates chamber revenue is by increasing member retention and attracting new members. In addition to this, many chambers will find sponsors or advertisers to support the publication and generate revenue. The Business Intelligence Report is an excellent advertising vehicle for companies trying to reach other local businesses. The publication is well-targeted, highly read, and its small size means that sponsors don’t have to worry about getting "lost" in the publication. Will your service really help us retain more members? Your members need to justify their membership investment based on the perceived value of their membership. This includes the amount and, more importantly, the quality of tangible and intangible benefits. Our job is to provide your members with a benefit they appreciate and use. And although it shouldn’t be the only reason, it is one more reason to either join or stay with the chamber. That’s how we increase retention. Offering the Business Intelligence Report to your members shows that you care about the success of their businesses. Can we measure this retention? That’s a tough question. Many factors go into whether a member stays with a chamber or not. Let’s face it, you can’t simply ask, "Did you stay with the chamber because of the Business Intelligence Report?" If the Business Intelligence Report is the only reason your members are staying with the chamber, your chamber has bigger problems than we could probably address. Usually it’s a mix of benefits that makes the difference. Even so, we can indirectly measure how well we are helping you retain members. We do this by surveying your members and asking them to rate how valuable the publication is to them and how important their benefits package is to remaining a member. If we rate as one of the top member benefits, and benefits are important to your members, it’s likely that we’ve made a positive impact on your chamber’s revenue. We offer this option for free to clients who have been with us for one year or more. Call for details. We don’t have a retention problem, why would we use your service? Many of the chambers that we work with don’t have big retention problems. We asked them why they use our product. What we found was that these chambers normally don’t have retention issues because they are already proactive in providing for their member's needs. They immediately saw the value of offering the Business Intelligence Report and made it part of their benefit mix to create value and goodwill. How would we distribute the publication? 1) E-mail is the least expensive method and has become the most popular. We've developed an easy-to-read HTML e-mail version along with a text version for text-only email clients. Our original PDF version can also be emailed to your members as an attachment, or you can email a link to the PDF version posted on your web server (see method 2 for more on this solution). 2) You can post it on your chamber’s Web site. However, it must be located in a password-protected, members-only area. This can also be a great way to drive member traffic to your web site, but you need to create a way to let them know there’s a new issue each month (such as emailing a link to the new issue). 3) You can also insert part or all of it into your existing newsletter. This is often done to save on printing costs and to increase newsletter readership. 4) Finally, you can print the publication and mail it to your members. This is one of the most effective ways to communicate with your members, but additional costs are involved. Chambers that use this method will usually have sponsors or advertisers to cover printing and mailing costs. How would we receive the publication? We e-mail the PDF version of the publication on the 24th of each month for the following month’s issue. The HTML version can take an extra day. We also offer several formats: Adobe Acrobat (the most common format and the viewing software is free), InDesign and HTML. We can also supply the publication text as a Microsoft Word file if you are planning on using the editorial in your newsletter. Do we have to print the publication exactly the way you give it to us? No, you can use as much or as little as you like, place a different flag on it, redesign it or keep it like it is. Most chambers keep the publication intact so that their members know the chamber has set up a special deal with a national publisher. Members feel good knowing they are getting a valuable publication as part of their membership. What determines the price for your service? Many factors go into this: your chamber size, number of copies reproduced, exclusivity arrangements, etc. Normally our rate will range between 10 and 50 cents per member per month. Call for details. Click here to contact us. We are happy to answer any questions.